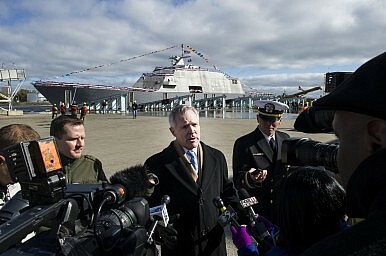 Secretary of the Navy (SECNAV) Ray Mabus speaks with media after the christening ceremony of the future littoral combat ship USS Detroit (LCS 7) at Marinette Marine Corp. shipyard in Marinette, Wisconsin. The new warship is expected to be commissioned in late October. The Freedom-class Littoral Combat Ship (LCS) USS Detroit completed acceptance trials on July 15, the U.S. Navy announced on July 22. The acceptance trial was the last significant milestone before the ship’s transfer to the U.S. Navy; it is slated to be commissioned in late October. Once commissioned, the USS Detroit will be transferred to the West Coast, where she will join three other Freedom-class LCSs: the USS Freedom, USS Forth Worth, and USS Milwaukee, all homeported in San Diego. The U.S. Navy expects to add at least nine more Freedom-class variants of the LCS to its surface warship fleet in the coming years. In addition, there are also 13 Independence-class variants of the LCS currently under construction. The U.S. Navy also plans to build a more heavily-armed and armored LCS variant, designated a frigate, as a response to advances in effective counter-swarm defense. The U.S. Navy intends to equip its fleet of LCSs with both the RGM-84D Harpoon Block 1C and the fifth-generation over-the-horizon Kongsberg Naval Strike Missile (NSM). (A NSM was test-fired from the USSCoronado in 2014.) However, as of now, neither the Harpoon nor NSM have been integrated with the combat system of the LCS. “Harpoon in the present installation is a stand-alone weapon system,” Larson said. But this will change by the end of the year. As I noted elsewhere, all variants of the LCS are specifically tailored for shallow coastal waters and can customize around 40 percent of its volume to adapt to different types of mission packages, including surface warfare, mine countermeasures, and anti-submarine warfare. However, the LCS’s anti-mine warfare technology failed repeatedly in tests and might be dropped all together. In February, in a letter to Secretary of the Navy Ray Mabus and the U.S. Navy’s chief of naval operations, Admiral John Richardson, the senior leaders of the U.S. Senate Armed Services Committee—Senators John McCain and Jack Reed—pointed out delays in initial operational testing of LCS mine countermeasure warfare, surface warfare, and anti-submarine warfare mission packages. The USS Coronado will be armed with advanced anti-ship missiles, despite mixed results from a recent test.